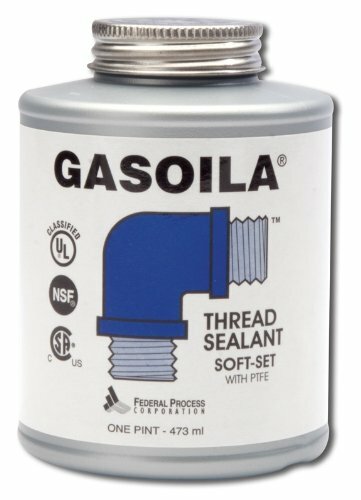 Home › Gasoila Soft-Set Pipe Thread Sealant With Ptfe Paste Non Toxic -100 To 600 De..
Gasoila Soft-Set Pipe Thread Sealant With Ptfe Paste Non Toxic -100 To 600 De.. Size: 1 Pint Premium pipe thread sealant with PTFE. Provides a positive seal on pipethread, joints, fittings, hoses, nozzles, LPG cylinders, pump assemblies,motors, oil burners, hydraulics, compressors, engines, housings, plugs, fuellines, couplings and more. Excellent resistance to gasoline, up to 20 percentalcohol and petroleum blends, petroleum solvents, kerosene, diesel oil,propane, butane, LPG, cutting oils, ammonia, aliphatic solvents, acids, steam,potable water, compressed air and more.